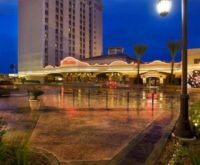 Tuscany Suites & Casino is an all-suites property located on Flamingo Road just a few blocks east of the Las Vegas Strip. The boutique-like hotel with a Mediterranean atmosphere sits on 27 acres that are lushly landscaped and feature fountains along with a lagoon-style pool. Guests will enjoy working out in the fitness center where there are also treatment rooms for spa services. There are four restaurants at Tuscany Suites & Casino that are sure to satisfy any hunger pangs. Indulge in gourmet-caliber Italian food — like the osso bucco — in a romantic setting at Tuscany Gardens. Guests can head over to Marilyn’s Cafe at any hour of the day. You’ll find everything from a wide range of breakfast offerings to a late-night menu — as well as fine dinner entrees like prime rib, pork ribs and seafood. Caffè Bottega serves freshly brewed coffee and smoothies. You can also get quick eats like salads and paninis there. Try your luck at one of more than 800 slot and video poker machines in Tuscany Suites & Casino. There are plenty of table games (blackjack, roulette and craps) too. Sports fans can place bets at the William Hill Sports Book situated near the main entrance. A good night’s sleep is guaranteed in the spacious suites because the beds come with pillow-top mattresses. Other amenities include refrigerators, coffeemakers and cable TVs. There is a small dining table and a living area with a sofa and armchair. Bathrooms boast separate tubs and showers. Tuscany Suites & Casino also offers 40,000 square feet of space for meetings, conventions and special events such as wedding receptions.